People have asked, Why did you move to Japan? Where are you? What are you doing? Why did we move to Japan? From the beginning: Traveling has always been a passion of mine. I got the bug in college with month-long study abroad classes in Spain and Russia. I studied abroad for a semester in San Juan, Costa Rica. Robert and I have traveled to Mexico several times, exploring areas off the beaten path. After I got my master’s in teaching, it was always my desire to teach abroad. But I was hired at a local school district and got swept up in a series of jobs teaching Spanish for four years. I wouldn’t change this experience for anything, mostly because of the relationships that I formed with my students. They are among my favorite people on Earth! But, I felt like I hit the ceiling in my school district. I worked part-time and had been laid off twice previously. Year to year, there was no certainty. There was also a lack of professional development and leadership in my building. So I reluctantly left teaching for a job as a trainer for the government, teaching adult abuse investigators throughout the state. This job paid twice as much as I made teaching. (Did I mention yet how underfunded public school educators are?) Again, I am happy that I was hired and I became proficient in the job. But still, this wasn’t the right fit for me. I applaud the people that I met who do this difficult work. Lesson learned: high salary does not equal satisfaction. But, I have a master’s degree—couldn’t I have both salary and a position working with students? In October, I heard about a few openings through a program at Willamette University that sends educators to a Japanese university to teach English. I had thought about applying for the position the previous year, but I was reluctant. After all, I didn’t speak Japanese and I knew nothing of the Far East. Long story short, I took a leap of faith. I’ll never forget the phone call I got on November 30 informing me that I was hired. A chance to revisit a dream not yet forgotten! 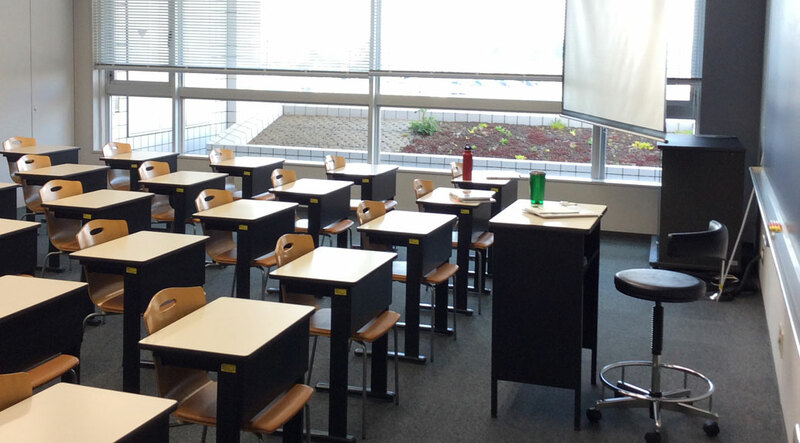 Before going to Japan, I started teaching in January at Tokyo International University of America (TIUA). TIUA is a part of Willamette University. 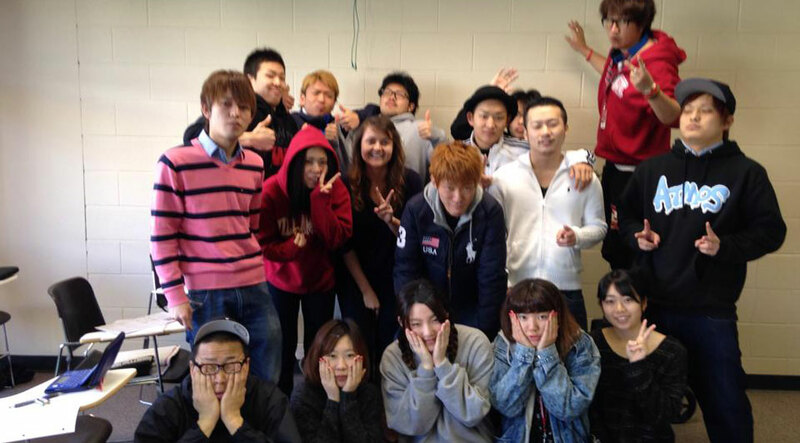 Students from the university where I am teaching now in Japan come to Willamette to study abroad for a year. Some of my students at TIUA. I’m in there somewhere! At TIUA, I joined a cohort of other teachers that now has 10 members. We are the second group to be hired and we have signed contracts for two years. We join a group of 10 teachers who have already been in Japan for a year. The university is hiring four more teachers this September. Teaching at Willamette was my first foray into the world of teaching English to speakers of other languages (TESOL). When my family came to the US, I was thrown (I think the technical term is “mainstreamed”) into public school long before there were English as a Second Language (ESL) programs so I know firsthand how difficult it can be to navigate the English language. When I told people I was going to teach English, I think the response I got implied, “oh, just English? I know so-and-so who taught English in such and such. It was easy.” Um, no. I think most Americans (and all people really, no matter the country of origin) are ethnocentric and think their native language is easy and don’t know the difficulties learning a foreign language past taking Spanish for two years in high school umpteen years ago. More about this in a later post. In late March, Robert and I moved to Japan and I now teach at Tokyo International University (TIU), a private university in Kawagoe, Japan. 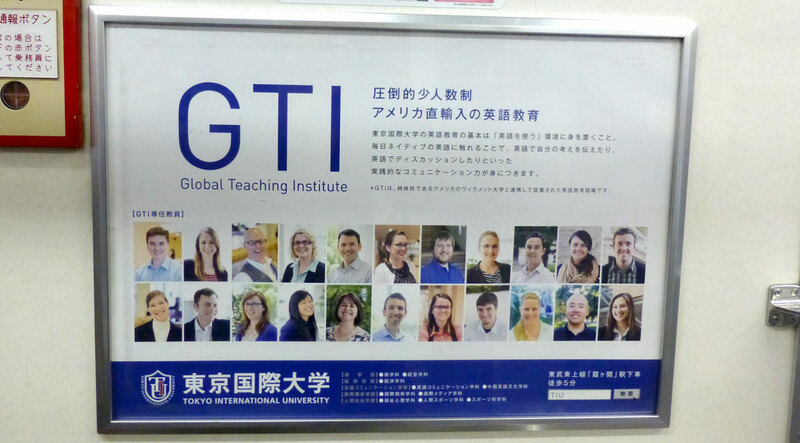 My position is called Global Teaching Fellow (GTF) in the School of Language Communication, Department of English Communication. The GTFs on an advertisement on the train from Kawagoe. I am on the top row, second to last. I teach six classes and their names are extensive, but mostly they focus on the following skills: reading, writing, speaking and/or listening in English. The students are divided into sections based on their TOEIC score. The TOEIC and the TOEFL are tests that measure students’ English proficiency, each with a slightly different focus. I am teaching sections 5 and 12 of the freshman classes and 4 and 8 of the sophomores; a mix of beginner and intermediate students (well, mostly beginners—more on that later!). My class sizes are between nine to 12 students each. I have a total of 41 students. A huge feat considering I’d have these kinds of numbers in just one class in public school. I work from about 8 a.m. to 5 p.m. most days and usually some preparation on Sunday. I have never had six “preps” before (six separate classes to lesson plan for) so this has been a huge lesson for me in staying organized. It is hectic most days, but I like staying busy and productive. I teach on the fifth floor of our building (our offices and the English Plaza are on the second floor). I am also very happy and thankful to be in the same classroom for all of my classes. In my schedule, I have weekly time assignments in the English Lounge. 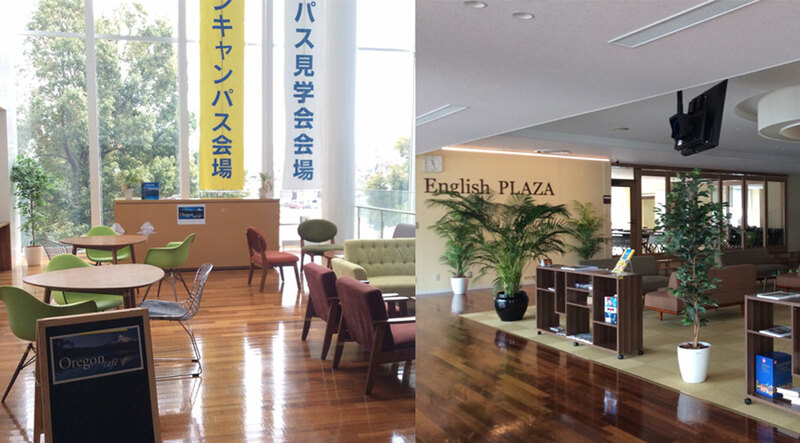 This is a modern, newly renovated area on our floor where students come and practice using English. They can play games, order coffee, check out books, etc. 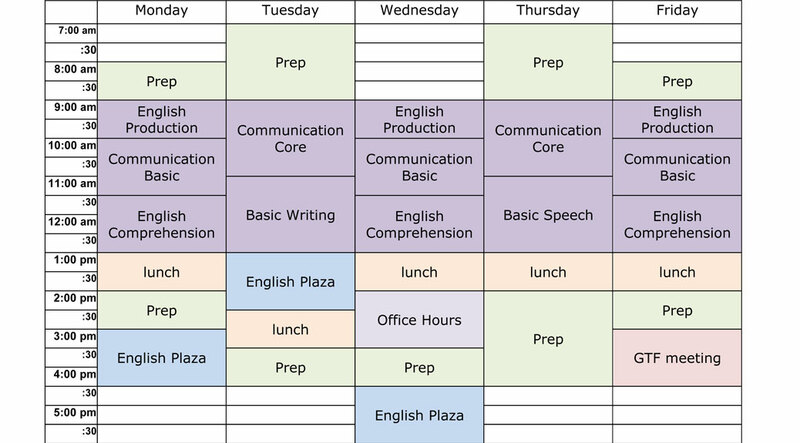 For speaking class, students are required to sign up for 10 sessions in the English Plaza per semester. I check to see which students have signed up to speak with me and then we have conversations on topics ranging from their hobbies, travel time on the train (most students commute between 30 minutes to two hours one way to school) and their favorite member of One Direction or J-pop (Japanese pop music) artist. We live in Kawagoe, Japan. It’s about 30 minutes train ride north from Tokyo. The prefecture (district/county) is Saitama. Kawagoe is the Sister City of Salem, Oregon. I have about a 15-20 minute walk to work. I love my commute. I don’t miss our 90-minute daily commute at all! I think we live in the perfect location. Close enough, but far away enough from both work and Tokyo. Kawagoe is a college town. There are advertisements for the university on most of the trains, including one with all of our pictures. The GTF program is under the Global Teaching Institute, which also includes the TIUA study abroad program at Willamette University. Moving here has been difficult and quite a roller coaster. But I am excited to have the chance to teach again—in a university setting no less! Please let me know if you have any questions and I’ll be sure to address it in a future post. Thank you Viktoria for a very informative report about your job at the university. Hi Viktoria and Robert!!!! Glad you wrote about what you are actually doing!!! So awesome!!!!!!!! I wish you both the best and have a blast!!!!!! Viktoria, I’m so glad you guys were able to go. We really miss Robert at work, I miss having someone familiar with quality assurance to get suggestions from, but I can’t even imagine what an awesome experience this is! Fun to read about! Thanks for reading! We’ll be back in no time!